European buckthorn is native to Eurasia. It was introduced to North America as an ornamental shrub for fencerows and wildlife habitat. This invasive alien species is found in Manitoba and is a large problem in natural areas in Winnipeg. Because of its tolerance of a wide range of moisture and light conditions, along with its prolific seed production, European buckthorn is able to successfully invade many habitats. Buckthorn grows throughout Manitoba and southern Ontario in a variety of habitats, and is often found in woodlands and open fields. It forms dense thickets that crowd other plants and can alter nitrogen levels in the soil, which prevents native species from growing. This plant produces a large number of seeds, allowing the species to that spread and grow quickly. The dense shade produced by stands of this tree reduces local biodiversity. It has been speculated that this shrub also produces a substance that inhibits the growth and development of other understory plant species, thus ensuring its success. Buckthorn grows throughout Manitoba and southern Ontario in a variety of habitats, often found in woodlands and open fields. It forms dense thickets that crowd other plants and can alter nitrogen levels in the soil, which prevent native species from growing. This plant produces a large number of seeds, allowing the species to that spread and grow quickly. European buckthorn is fairly easy to identify, as it leafs out early in spring and is one of the last deciduous shrubs to lose its leaves in late autumn. It grows from two to six metres in height with a dark outer bark covered in small pores and an orange inner bark. The twigs are covered in a waxy coating with some individuals bearing prominent sharp thorns. 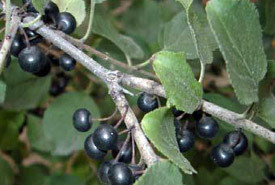 The poisonous black berries ripen in August and September and remain on the stem throughout the winter. There are a variety of methods used in the control of European buckthorn, including hand pulling, girdling, cutting, herbicides and burning. There is no natural control for European buckthorn in North America. In Manitoba, NCC is working in collaboration with the Invasive Species Council of Manitoba — a province-wide leadership body that has adopted a cooperative approach involving a number of key organizations and agencies to eradicate or limit further spread of invasive alien species. An integrated approach involving awareness, prevention, early detection and rapid response are likely our best defence at controlling the entry of new invaders from becoming widespread infestations. Report a sighting of European buckthorn. Call the Invasive Species Council of Manitoba at (204) 232-6121 or visit their website at www.invasivespeciesmanitoba.com. Finding these invasions early is a key to eradicating them.